but save A LOT of money each month!" Moving to BirdSend from ActiveCampaign has been a great switch for my business. Not only am I saving a lot of money each month, but the average open rates I get from BirdSend were similar to ActiveCampaign. I love how uncluttered and easy the interface is. Plus, any time I've had questions they have been answered thoroughly and quickly. BirdSend has the best customer service I've ever experienced! and is constantly improving the platform!" to our previous email marketing provider"
An email marketing platform's ultimate job is to increase your revenue, even when you're not actively working. We're guessing no. Which means you don't know exactly how much revenue you get from email marketing. Totally not your fault... but your current email platform's fault. No worries though. With BirdSend, you can now do everything above. Currently, only a small handful of smart business owners have access to this platform. Will you be one of the select few to get a head start over others? Do you worry about spending too much money (and time) to acquire a new subscriber just because you don't know how much each is worth to you? With BirdSend, not only will you know how much income you get from every email, you'll also precisely know the Lifetime Value (LTV) and Average Lifetime Value (ALTV) of your subscribers. Knowing your ALTV arms you with the clarity and confidence to go 'all out' in your paid advertising campaigns. You only need to make sure you're spending less than your ALTV to acquire a new subscriber. Without knowing your ALTV, you're flying blind. So you spend $50 to get a new subscriber, but you earn $100 in return. This is akin to printing money on demand. How often would you do it? Which is why we created BirdSend from the ground up. We created it especially for YOU -- the confused business owner who just want to increase and track your email marketing revenue. 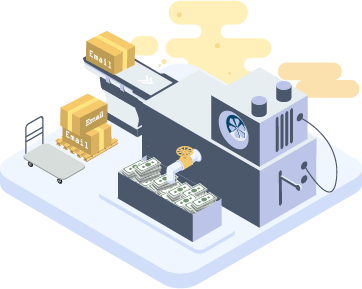 BirdSend 'opens up your eyes' so you know with absolute certainty which emails are your profit generators (focus on creating more of them) and which are dud (discard them). It's like you now have superhero-esque clarity! Sending, tracking, and automating emails with BirdSend has been painstakingly engineered with state-of-the-art technology. The result is a noob-friendly point-and-click easy email marketing platform… so that you can focus on other things that matter the most to you. We do all the hard and tedious work, you just need to plug-n-play, and experience an increase in sales. "Switched from Mailchimp. Ease of setup and quick learning curve leads to a phenomenal user experience!" An email marketing automation tool packed with great features. It can be as simple or advanced as you want it to be — depending on your needs. I can easily and quickly set things up the way I want them — things like opt-in forms, user tags, automating the tagging process, creating sequences/drip campaigns and broadcast emails, etc. I've used other mainstream email marketing tools before... but what I like more about BirdSend is the ease of setup and quick learning curve. Their user interface is minimalistic without compromising on advanced features. This leads to a phenomenal user experience. "A very streamlined platform — does a handful of things really really well!"